This race is the play of the day. Preachintothedevil finally cuts back to a dirt sprint. His biggest career win was in a dirt sprint. His highest career beyer fig was in a dirt sprint. His dam was the famous Grade I winning dirt sprinter Acey Deucey. So what does Contessa do with this crack sprinter? He runs him in grass routes, dirt routes, poly routes , turf sprints- with the way this guy has been handled I am surprised Contessa-San didn't enter him in a steeplechase. Finally he is entered in the right kind of race and he should give a true account of his skills today. ps. This is my first post after an extended hiatus from the game. It’s the end of October and that means two things. The first is that all of the important grade one races are over until the fourth of November and it is now time for the state breeding programs to shine. This upcoming Saturday is New York Showcase day and next week California bred runners take the spotlight. Last week Delaware and Thistledown showed off the best of their breeding programs from their states. The fact of the matter is that while a lot of the state bred races from any track is usually impossible to scope at times, they serve a purpose of bringing in handle and filling the daily racing cards. 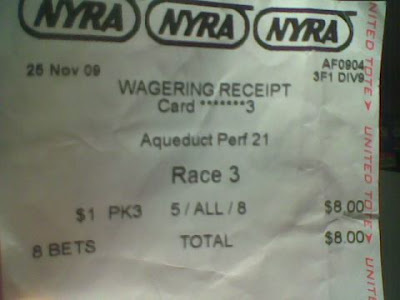 Without the NY bred maiden special weight or first level allowance races that usually populate the weekday cards, NYRA would likely have to cutback racing dates due to the lack of races being filled. Not to go as far as using the term “necessary evil”, but these races usually serve a purpose on a daily basis. In the instance of the showcase day cards, they usually are loaded cards with some decent fields. Not to mention the occasional horse on the rise that pop up once in a while. 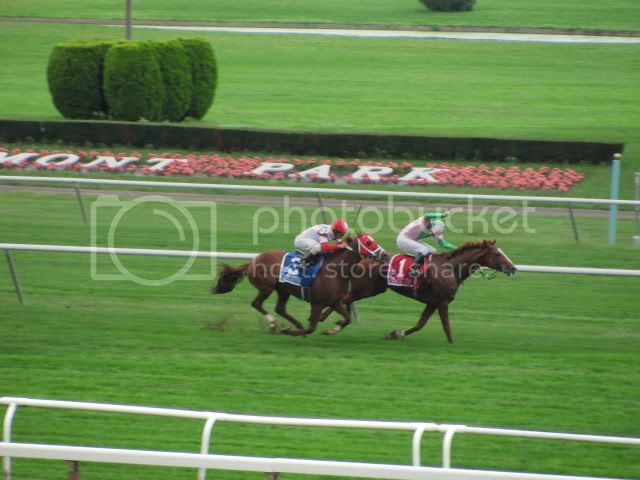 Funny Cide won the 2002 Sleepy Hollow and Haynesfield won the 2009 Empire Classic, the year after their victories were multiple graded stakes winners. The state bred showcase days serve as a useful part of the racing landscape at this time of the year when the all stars of the sport converge on location, leaving the feeder tracks with little pull in the way of attention towards their racing product. The restricted state bred stakes races fill what would be a dead card with some interesting match-ups and provide some cover to what otherwise would be referred to as a barren part of the racing calendar. Admittedly this site does not cover a lot of the news or horses that run on the opposite coast. It must be the three-hour time difference, general malaise towards the product offered at the three principal tracks, the two synthetic surfaces that are in place, the high takeout rates, or some combination of the four. Whatever the case may be, they do produce some decent runners for the big day much like the other major circuits do. A scouting report on the some of the big players coming to Louisville is in order. He is listed at 15/1 in the recent Breeders’ Cup write up for the Daily Racing Form. Seems a bit high even for a rough sketch on the contenders they list. Awesome Gem is the longest shot listed immediately after the Dude at 20/1. This one has been the hard trying type all year long and seems to favor dirt surfaces with two major wins over the Santa Anita surface. His early speed always puts him in contention and he could hang around for the finish if unattended and treated as cheap speed. It’s been an up and down year for this highly touted Baffert runner, after winning two straight grade two races he was defeated in the Arkansas Derby and laid up until the Pat O’Brien stakes where he defeated Smiling Tiger with weight concessions. The Ancient Title was a flat effort where he finished off the board causing high rolling show bettors to look for tall buildings and bridges. He is a Jekyll and Hyde horse if there ever was one, which one will show up on the first Saturday of November is anyone’s guess. Buyers beware. If Stacelita is at the top of the older filly grass ranks for the U.S. then this one is not far behind. They were one-two in their only meeting on a neutral site at Arlington Park and those two went on to win their next starts in easy fashion. The 11 furlongs of the distaff turf race will be a question mark for this one though as it will be her first trip going three turns and an eighth of a mile longer than she has ever gone in her career. Her rival Stacelita has already done the trip against colts in the United Nations back in July with a respectable third to show for it. Reports about the demise of his racing career have been greatly exaggerated. After brawling with the apex of his class throughout his three-year-old season and showing four in the money finishes out of eight starts with no wins it looked like he was burnt out. After a November to March freshening he had four starts down in Florida with the same results as his 2010 season. 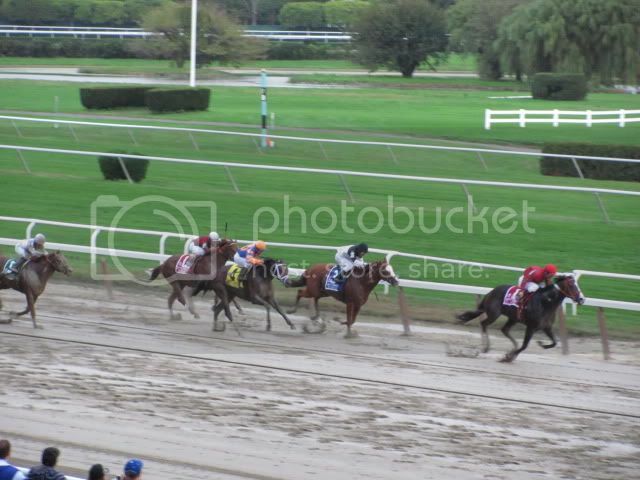 Then there was a sudden revival when he hit the track at Saratoga, two straight wins in convincing fashion. Something broke him out of the malaise of his 0-12 skid that lasted from 2010 to 2011. Was it the fresh country air of Saratoga, the beautiful women who attend the races up there, the mineral rich spring water, or maybe a combination of any of these factors? No, it was the fact that he got back to what brought him to the dance. Sprint races got him noticed as a juvenile down at Calder and eventually led to the high profile acquisition by Robert LaPenta. In his most recent at Belmont, he had Uncle Mo by the collar at the top of the stretch before the big horse turned on the afterburners. The thought process now among the connections is that if he can run 7/8 of mile, he can run the flat mile, heck he almost circled a talented colt at the mile distance. The Breeders Cup Sprint is a better option. The pace is usually hot enough for a closer like Jackson Bend to make a sustained bid and as mediocre as the middle distance dirt runners, the sprint division is doing its part in keeping pace in this category. The cutback from a mile to six furlongs is not without foundation either, Silver Train pulled off the feat back in 2005 by running in the mile Jerome Stakes and winning the Sprint later on. Some closers at the 7/8 distance look like they can get the extra 660 feet because of the explosive kick they have shown at the shorter distance. A good percentage of the time that is due to the pace at seven furlongs being hot and the horse getting on a roll at the right moment. The mile can be trickier; sometimes the pace does not develop and this leaves the closers behind the eight ball. Jackson Bend is a better fit for the sprint based on the fact he has shown very little in the way of winning past the sprint distances. If he does go in the mile he will be an overbet option in a large field, not the type of preposition any gambler should make. If he goes in the Sprint he will one of a plethora of viable options to take down the jackpot and you may get a price on him. If Zito is a reader of this site then here is a bit of free advice, RUN JACKSON BEND IN THE SPRINT. Super Saturday was a formful day where the betting favorite took down four out of the six stakes races. Speed seemed best on the muddy dirt surface where most of the winners were either close to or on the the lead in the early stages. 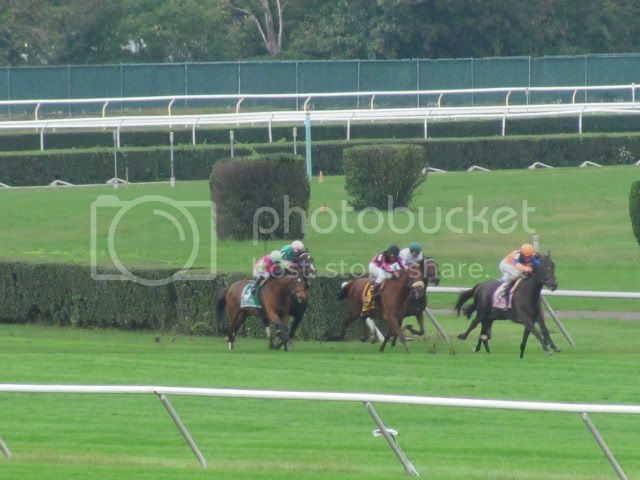 Stacelita continued her superiority over her own gender on the turf. She will likely be a very well bet favorite for the Filly and Mare Turf off of this effort. How good is this filly? Dubawi Heights, the filly who ran second to Stacelita in the Beverly D. won the Yellow Ribbon a couple of hours later. Cape Blanco has been racking up the frequent flier miles lately and Dean's Kitten almost took advantage of this. Dean's Kitten ran as a good a race as any of the other winners from today's card. The cross continental trips may be taking a toll Cape Blanco and if he goes in the BC Turf he could be a good play against. Giant Ryan got to the front during the early stages and did not look back. As the old advertisement for the NY breds goes, "They start with an advantage.". 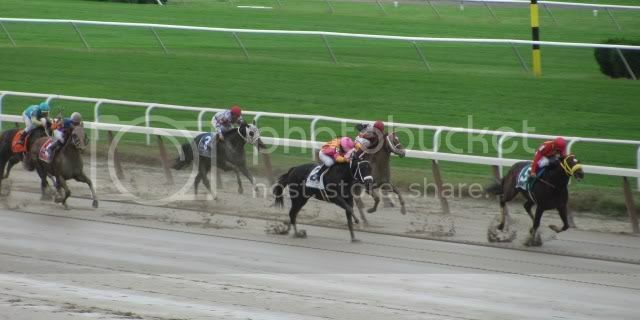 Uncle Mo loves Belmont and rolls into the Breeders' Cup with this zippy win. The connections of Uncle Mo are toying with the idea of going to the Classic if he did well in this race. It seems like a bad idea, Fusaichi Pegasus tried to the mile stretch out to the classic with no success and Mo seems to thrive at the one turn mile. He could be the first horse to win two different BC races either way, might as well try it in a spot he does well in. Jackson Bend made a nice run at the winner at the top of the stretch, he has matured into a decent long sprinter. The spot I would run him in off of this race is the BC Sprint, the Dirt Mile may be an 1/8 beyond his best distance and he has not attempted the six furlong distance in quite a while. It may be worth a shot to run in the Sprint. Havre de Grace won the Beldame with ease and she looked the part of a champion every step of the way through this race. With Blind Luck's loss in the Lady's Secret, her arch rival Havre de Grace edges that much closer to her hopes at Horse of the Year honors. 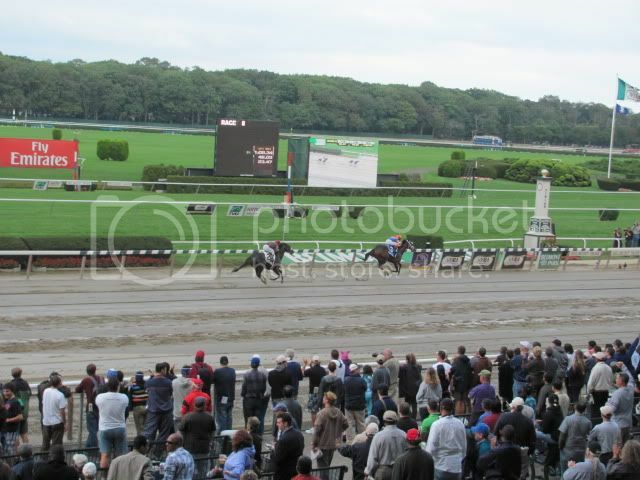 Flat Out made it two for two over the Belmont dirt with his victory in the Jockey Club Gold Cup. Stay Thirsty made a run at the winner, but it was too late. Drosselmeyer ran a nice effort to grab the place spot by making up ground in the last eighth of a mile, this effort could set him up well for the BC Marathon.